Our object this week celebrates Women’s History Month. 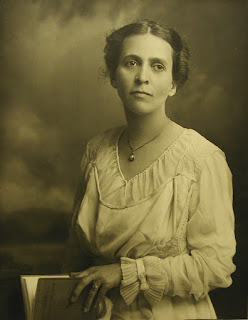 Susan Merwin (1874-1923) was only the second woman to head an American school for the blind when she became Superintendent of the Kentucky School for the Blind in 1912. And she became the only woman to head APH when she took over our reins from B.B. Huntoon in 1919. In truth, though, Merwin had been running APH for years as Huntoon’s assistant while he suffered from various ailments. Her work in Washington DC in July of 1919 while still assistant superintendent was critical. She testified before the House Committee on Education and Labor, leading to the first increase in the federal appropriation to APH in forty years. After becoming superintendent, she lead a series of initiatives to modernize equipment, remodel the building’s interior and exterior, and accelerate the transition at APH to the production of braille. Her death in 1923 from influenza cut short a brilliant career. In her official portrait, (included here) shot in 1916, she wears a white dress, a gold pendant around her neck, and her dark hair is pulled back. She stands at an angle, holding a spelling book half open, and looks slightly off camera.